Thanks everyone for taking a look at my site. Be sure to get in touch with your thoughts and suggestions. I'll be updating frequently, so please check back often. 04/20/06: Michelle had a luncheon in the East Room of the White House today with Chinese president Hu JinTao, and President Bush! Michelle was chosen to sit right next to President Bush on his left side, with President Hu at Bush's right. Here are pictures from Yahoo!. More than 150 prominent Chinese Americans and celebrity guests were invited. I've redone some pages on this site. I changed About Me to Links & About Me. 03/29/06: 2005~2006 skating season is now officially over... :-( It hasn't been that exciting without Michelle, I miss her so much! By the way, Michelle Kwan Fanatics hits 1000 viewings today! 03/02/2006: Videos updated. I do add articles without putting a notice here. 02/10/2006: Michelle has arrived in Turin and is attending the opening ceremony! Here are pictures of Michelle at the Opening Ceremony from Heather's Michelle Kwan Fan Page: 1, 2, 3. Michelle was was interviewed on the Today show on Friday, Feb 10. Here are pictures from Heather's Fan Page: 1, 2, 3, 4. 02/07/2006: Michelle is unanimouslly nominated to be the flag-bearer of the U.S. Olympic team at the Opening Ceremony! See the article here. Scroll down. 01/28/2006: Michelle had a monitoring session for her short and long program yesterday, and Michelle Kwan Will Compete at Olympic Winter Games! 01/20/2006: A new transcrpit page, Jim McKay's tribute piece on Michelle. 01/13/2006: Sorry that I'm not updating often, EXAMS JAN. 24 ~ 27. 01/06/2006: Michelle Kwan Fanatics hits 200 viewings today! I would like to THANK EVERYONE for taking a look at this site. Don't forget to email me or leave a message in myguestbook if you have any suggestions. Thank you again. 01/03/2006: Michelle’s 2005 ~ 2006 long program music is listed on 2006 U.S. Figure Skating Championships program reportedly. It is... drum roll please... "Prelude In C-Sharp Minor, Op. 3, No. 2"! 01/01/2006: Happy New Year everyone! Check out the practice groups for 2006 U.S. National Championships. 12/29/2005: December 29th, 2005, 03:58 PM EST, Michelle Kwan (MichelleWKwan) posted a happy holidays message on Michelle Kwan Forum. 12/27/2005: ESPN gave an update on Michelle during Grand Prix Final Skating News. Michelle says that she will be in great shape for Nationals, and has no more setbacks. 12/26/2005: Some pictures have been added. I will add more soon. Details of the results are posted here: http://www.ifsmagazine.com/forum/index.php?showtopic=37 A total of 104,418 votes were cast throughout the show. 11/28/2005: Michelle Kwan Fanatics hits 100 viewings today! 10/25/2005: Michelle resumes skating, but withdraws from Cup of China. 10/06/2005: Michelle withdraws from Campbell's Classic and Smart Ones Skate America due to Injury. http://www.usfigureskating.org/Story.asp?id=30981&type=news Get well soon Michelle! 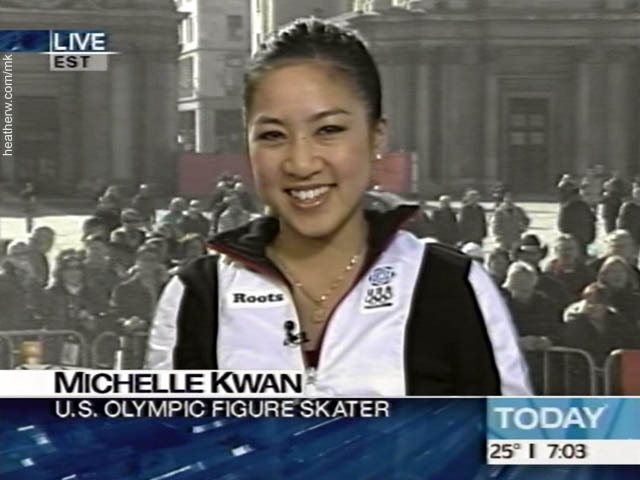 07/18/2005: I, QianHui Zhang, started this Michelle Kwan Fanatics Website today!